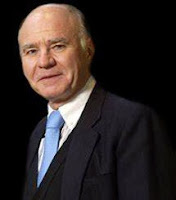 Marc Faber reaction today during a Bloomberg TV interview is even more prescient. Fearing that Janet Yellen "would make Bernanke look like a hawk," Faber explains that he is not entirely surprised by today's no-taper news since he believes we are now in QE-unlimited and the people at the Fed "never worked a single-day in the business of ordinary people," adding that "they don't understand that if you print money, it benefits basically a handful of people." Following today's action, Faber is waiting to seeing if there is any follow-through but notes that "Feds have already lost control of the bond market. The question is when will it lose control of the stock market." The Fed, he warns, has boxed themselves in and "the endgame is a total collapse, but from a higher diving board." "My view was that they would taper by about $10 billion to $15 billion, but I'm not surprised that they don't do it for the simple reason that I think we are in QE unlimited. The people at the Fed are professors, academics. They never worked a single life in the business of ordinary people. And they don't understand that if you print money, it benefits basically a handful of people maybe--not even 5% of the population, 3% of the population. And when you look today at the market action, ok, stocks are up 1%. Silver is up more than 6%, gold up more than 4%, copper 2.9%, crude oil 2.68%, and so forth. Crude oil, gasoline are things people need, ordinary people buy everyday. Thank you very much, the Fed boosts these items that people need to go to their work, to heat their homes, and so forth and at the same time, asset prices go up, but the majority of people do not own stocks. Only 11% of Americans own directly shares." "On September 14, 2012, when the Fed announced QE3, that was then extended into QE4, and now basically QE unlimited, the bond markets had peaked out. Interest rates had bottomed out on July 25, 2012--a year ago--at 1.43% on the 10-year Treasury note. Mr. Bernanke said at that time at a press conference, the objective of the Fed is to lower interest rates. Since then, they have doubled. Thank you very much. Great success." "Well, the endgame is a total collapse, but from a higher diving board. The Fed will continue to print and if the stock market goes down 10%, they will print even more. And they don't know anything else to do. And quite frankly, they have boxed themselves into a corner where they are now kind of desperate." "She will make Mr. Bernanke look like a hawk. She, in 2010, said if could vote for negative interest rates, in other words, you would have a deposit with the bank of $100,000 at the beginning of the year and at the end, you would only get $95,000 back, that she would be voting for that. And that basically her view will be to keep interest rates in real terms, in other words, inflation-adjusted. And don't believe a minute the inflation figures published by the bureau of labor statistics. You live in New York. You should know very well how much costs of living are increasing every day. Now, the consequences of these monetary policies and artificially low interest rates is of course that the government becomes bigger and bigger and you have less and less freedom and you have people like Mr. De Blasio, who comes in and says let's tax people who have high incomes more. And, of course, immediately, because in a democracy, there are more poor people than rich people, they all applaud and vote for him. That is the consequence."